We are comparing Rome Angels and Demons Half-Day Tour Prices from leading ticket suppliers and Try to find you Cheap tickets prices on the market. Whether you an avid Dan Brown fan, or just looking for an alternative way to visit Rome, the Angel's and Demons guided city tour is a truly unique experience. 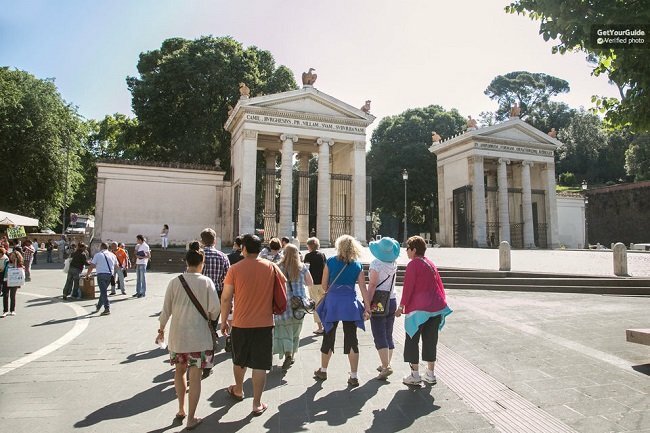 A perfect way for visitors to see the city of Rome, from its busy and beautiful squares to its vacant alleys, from wide boulevards to secret passages. See some of the best examples of architecture that Roma has to offer and stop for coffee just as the Italians do. During the 4-hour tour you'll visit the Piazza Navona, Bernini's famous ‘Ecstasy of Saint Teresa' sculpture, the church of Santa Maria della Vittoria, Santa Maria del Popolo Church, Castel Sant'Angelo and see the grand façade of St Peter's Basilica in the Vatican City. This unique tour will also take you to the entrance of the underground passage hidden inside the Church of Illumination. This tour is a journey which combines the myths and conspiracies of Dan Brown's bestseller with the genuine history, art and culture of the ‘Eternal City' of Rome. This tour should appeal to anyone interesting in history, art, and literature but specifically to fans of Dan Brown's ‘Angels & Demons'. If you interested in taking a city tour in Rome but would prefer something a little different then this could be the tour for you. Your Experience With Rome Angels and Demons Half-Day Tour? Soak up the beauty of Rome; stunning squares, grand buildings and ancient sites. Follow the fictional path through Dan Brown's bestselling novel ‘Angels and Demons' in the real city that the book is set in. Leave behind the crowded piazza and discover the hidden passageways of Central Rome. Enjoy an English commentary and learn about Rome from your expert local guide. Enter Castel Sant'Angelo, and travel through the city by comfortable coach. What Rome Angels and Demons Half-Day Tour Includes? 4-hour small group guided tour. Angels and Demons themes tour. City transfers by coach during the tour. This is a small group tour therefore tickets are limited. We recommend booking the tour in advance during the busy summer season or during national holidays. Travelers Reviews about Rome Angels and Demons Half-Day Tour? This is one of the best things to do in Rome, travellers have given the 4-hour excursion almost entirely 5-star rating on TripAdvisor, Get Your Guide and Viator. Reviews say that the guides are excellent and speak fluent English. Comments also say that the tour visits interesting places around the city. Be sure to arrive prior to departure time as some travellers point out that guides do not wait for late arrivals. Tickets are accepted in paper or mobile form. Tickets are refundable up to 3 days prior to departure (depending on provider). Cancellation fees may apply if cancellation is made less than 7 days in advance. Be at the meeting point 15 minutes before departure time. Dress code: comfortable shoes are recommended, long sleeves and trousers or skirt which covers the knees should be worn to enter religious buildings. Tour ends are Castel Sant'Angelo. Meeting Point: Steps of Sant Maria del Popolo Church, Piazza del Popolo, Central Rome.